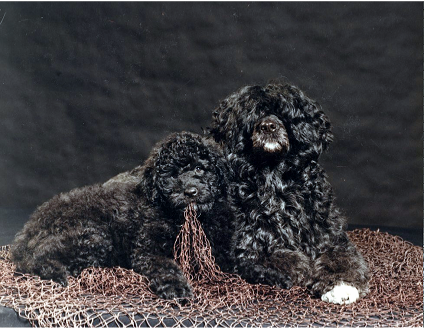 Our first Portuguese Water Dogs so enriched our lives that we began breeding them. Our goal was to produce PWDs with superior charm, health, beauty and athletic ability so that others could enjoy them as we had. Our breeding philosophy was to use the best pedigrees of the past to create an even better future. Now, after years of selective breeding, we are proud that CUTWATER dogs exhibit an unmistakable type and temperament. Highly successful in both the show and work rings, they are also dogs you can live with and love. The dogs of CUTWATER are our statement to you, the Portuguese Water Dog enthusiast. If you are new to the breed, you are invited to examine our dogs as a possible starting point. If you are experienced with PWDs, we encourage you to see for yourselves the exciting qualities our dogs offer as companions, working and show dogs .